LAUSD education: No LAUSD schools. She graduated from Bishop Alemany High School, a Catholic school in Mission Hills, and attended St. Euphrasia Catholic School in Granada Hills for elementary and middle school. Platform: Ensuring that all students, especially the most vulnerable, can graduate college and career ready, increasing access to support services through partnerships, supporting teachers so they can provide high-quality instruction, empowering school leaders and making sure the board’s decisions are made with community and family input. Campaign funding: Gonez has raised $108,364 and spent $34,722 as of Feb. 23. Independent expenditure committees sponsored by the California Charter Schools Association Advocates have spent $539,165 to support her. No IE funds have been spent to oppose her. Key endorsements: School board member Ref Rodriguez, former LAUSD school board member Yolie Flores, former LA mayors Antonio Villaraigosa and Richard Riordan, former U.S. Secretary of Education John King, Los Angeles Times, Los Angeles Daily News, California Charter Schools Association, San Fernando City Councilmember Sylvia Ballin, San Fernando Vice Mayor Joel Fajardo, International Longshore and Warehouse Union Local 13, North Valley Democratic Club, Avance Democratic Club. 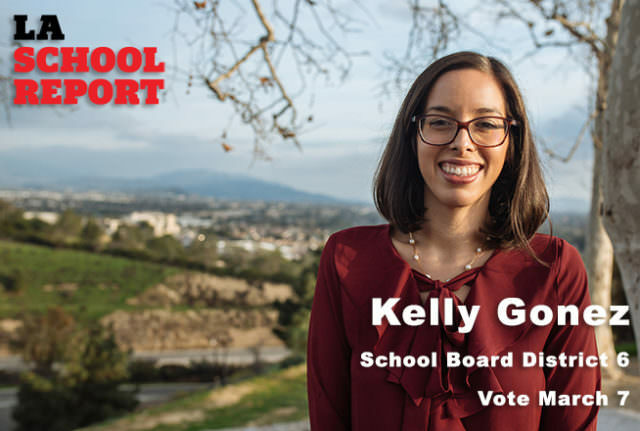 Kelly Gonez is the only teacher running for the East San Fernando Valley District 6 seat on the LA Unified school board now held by Mónica Ratliff, who is leaving the board to run for City Council. Patty López, Imelda Padilla, Araz Parseghian, Gwendolyn Posey and Jose Sandoval are also on the ballot for the March 7 primary election. Gonez is a seventh-grade science teacher at Crown Preparatory Academy in Los Angeles and worked as an education policy advisor in the Obama Administration. “I think I have a unique perspective as someone who taught at both the district and charter schools,” Gonez said. Gonez said she saw firsthand disparities in the education system. Her mother, an immigrant from Peru, faced barriers in education and the workforce, not because of her intelligence or skills, but because she looked different and because she was an English-language learner, Gonez said. “Fighting for those same opportunities for every child has always been something that’s been important to me,” she said. At 28, Gonez is the youngest candidate for school board this election. She lives in Sylmar with her husband, Manuel, who works in politics and policy, and was raised in the Mission Hills area of the northeast San Fernando Valley. She graduated from Bishop Alemany High School, a Catholic school in Mission Hills, and attended St. Euphrasia Catholic School in Granada Hills for elementary and middle school. Her mother attended an LA Unified adult school and now works at a hospital in Mission Hills. Gonez’s father works at a small manufacturing business in Van Nuys. While at UC Berkeley, where she worked three jobs to pay her way through college, Gonez became interested in teaching and worked as a teaching assistant in the Berkeley Unified School District. She said she always had a passion for social justice and public service. She has a master’s degree in urban education from Loyola Marymount University and wrote her thesis on supporting English-language learners in STEM education. After college, Gonez taught geometry at Dorsey High School in a temporary position and then was hired to teach science at PUC Lakeview Charter Academy, a middle school in Lake View Terrace. She said she learned that every student, even students who face challenges outside the classroom, can be successful if they have the right supports and opportunities. But she said she saw that decisions were being made at the policy level without the input of teachers. So she decided to use the experiences she had in the classroom to help shape policy. In 2014, she went to Washington, D.C., to serve as an education policy advisor in the Obama Administration. She worked on issues involving English-language learners, homeless students, students in foster care and students in the justice system. She said many of these students are over-represented in LA Unified and in board District 6. The office in the Department of Education where she worked held primary responsibility for developing the president’s annual budget, and she helped secure $50 million in additional funding to support targeted student populations. She returned to Los Angeles and started teaching again this school year. Now Gonez is hoping to take the experience she had in the classroom and at the national policy level to the board room at Beaudry. This is her first run for public office. If elected, she said she would hold all schools to a high standard. She doesn’t feel that board members are always putting students first in their decision making and that there is a lack of urgency. Gonez and Lisa Alva, who is running for the District 2 seat, are the only candidates in the three board races currently teaching in a classroom. When asked the importance of being “the only teacher” in her race, Gonez said, “Too often our current school board makes decisions without keeping in mind how those policies are going to have an effect on the classroom. As a teacher, I experienced this firsthand. That perspective is important as the board tries to boost student learning and success. She also would bring the community and teachers into the decision-making process. She noted that “half of our decline is simple demographics. But we need to bring students back to LAUSD. That doesn’t mean we demonize charter schools. Parents are going to charter schools because they are offering high-quality options or innovative models. We have to invest in traditional schools so that we can demonstrate to families that they can provide a great, well-rounded education for all children. We also need to tackle chronic absenteeism head-on, which is good for kids and good for the district’s financial situation. “On the cost side, we also need to run our operations more effectively. We must make budgeting decisions based on evidence of what works.